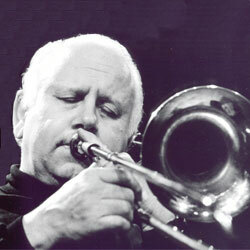 Trombonist and composer IAN McDOUGALL was born in Calgary, Canada, and grew up in Victoria, leaving there in 1960 to tour in Great Britain with the John Dankworth Band. He returned to Canada in 1962 and began a lengthy career as a freelance player, composer and arranger in Vancouver and in Toronto where, until 1991, he was also the lead and solo trombonist with Rob McConnell’s Grammy and JUNO Award winning group, “the Boss Brass”. Two suites composed by Ian have been recorded by that group – The Pellet Suite and the Blue Serge Suit(e). Ian was also lead trombone and a frequent composer/arranger for the Brass Connection, who won the JUNO Awardfor best jazz album in 1982. Since the early 1980’s McDougall has become even more involved in composition, and his works have been performed by the CBC Vancouver Chamber Orchestra and Choir, the Lafayette String Quartet, the Phoenix Choir, and the Toronto Syphony Orchestra, among others. Important compositions include concerti for Bass Trombone, for Clarinet, and for Saxophone, the 3 Canadian Folk Songs for choir and string orchestra, the Brass Trio, and Bells for Brass Choir. Ian now resides in Victoria, where he continues to play, compose, and teach –both in his private studio and also at the University of Victoria, where he is Professor Emeritus. The past decade has included tours as a soloist and with his quartet, to many countries including the United Kingdom, Ireland, Scotland, Denmark, Holland, Germany, Australia, Switzerland, and throughout the United States and Canada. In in the past decade Ian has been the leader on seven CDs. His double CD entitled “In a Sentimental Mood”, which features the music of Billy Strayhorn and Duke Ellington with Ian joined by a quartet, was nominated for both a JUNO Award and a Western Candadian Music award in 2006. Ian released a Big Band CD in August of 2007, “No Passport Required”. It is made up entirely of Ian’s compositions, and is performed by a sensational band of mostly Vancouver musicians, including Brad Turner, Phil Dwyer, Cambell Ryga, Oliver Gannon, Neil Swainson, and Ron Johnston. Ian also performed and wrote for the CBC CD project entitled “LIVE! Jazz Legends” , which was nominated for a JUNO award in 2008. In the fall of 2008, Ian will take his sextet to Europe! The sextet will spend 2 intensive weeks performing and giving workshops in Denmark and Sweden.